Beautiful beige color kurta with delicate embroidery on the neckline. The outfit comes with white pajama. Good for festival celebration, casual parties. 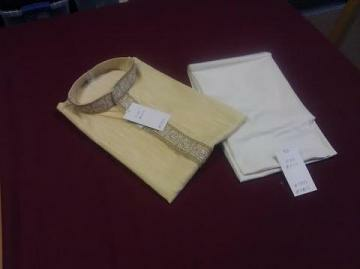 Color: Beige kurta and white pajama. Small 34 Shoulder: 17" Chest: 40" Length: 45.5"
Small 36 Shoulder: 17.5" Chest: 41" Length: 46" There are some stains. Medium 38 Shoulder: 18" Chest: 43" Length: 46.5"
Large 40 Shoulder: 18.5" Chest: 45" Length: 47"
Large 42 Shoulder: 19" Chest: 47" Length: 47.5"
X Large 44 Shoulder: 19.5" Chest: 49" Length: 48"
X Large 46 Shoulder: 20" Chest: 51" Length: 48.5"
XXL Large 48 Shoulder: 20.5" Chest: 53" Length: 49"
XXXL Large 50 Shoulder: 21" Chest: 55" Length: 49.5"
This item in Kurta Pajama for Men category was first added to our catalog on 12-29-2014. Buy Beige & White Embroidered Kurta Pajama for Men, sold & shipped by Shieno Boutique where you can shop online for Latest Sarees, Salwar Kameez, Shawls, Jewelry & Clutches. This Kurta Pajama collection has been tagged as mens kurta pajama dress, diwali eid festival outfit, indian clothing.